Roof Quilts… Or Just Beautiful Slate Roofs? A recent trip to Europe resulted in more pictures of roofing patterns and colors than of historical landmarks. Everywhere one turns in Germany, Switzerland, France and other countries, you see unique slate roofs with a variety of colors and patterns. These vivid building toppers enhance the character and charm of old city structures. At DaVinci Roofscapes, we specialize in color on the roof. With 49 standard colors to choose from (and an unlimited number of custom colors we can create!) our polymer roofing products are ideal for creating a roof quilt or special pattern. 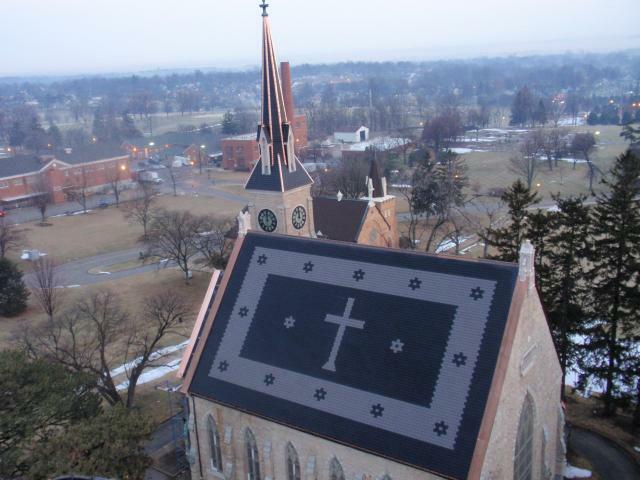 One location in the United States that has creatively used DaVinci imitation slate tiles to re-create a one-of-a-kind designer roof is the chapel at the Dayton Veterans Administration Medical Center in Ohio. (see The Chapel At Dayton Veterans’ Administration Medical Center). Twenty-seven squares of medium tan synthetic slate roof tile and 67 squares of slate black tiles were used to create a large cross design with a star-studded border on the chapel roof. Once completed, the two sides of the roof (plus the steeples and vestibules) were once again the showpiece of the campus. When you’re ready to create your own custom color for a composite slate or synthetic shake roof, visit our DaVinci Color Studio for ideas and inspiration!